This year has been the year David Vamplew has travelled a lot. In September last year he won the UKIPT Main Event Grand Final EPT. This took place in London on September 29th last year. He won after an epic 5 hour final heads-up duel with John Juanda. This started a tremendous year of poker for David in which he has accumulated tournament winnings of almost 2 million dollars. This also gave him entry to the European Tournament of Champions Event the following day for all European Tour winners. He won this event also and with it a seat at every European tour event for the next 12 months. Hence the relentless travel around Europe. Born in Kirkcaldy, 30 miles north of Edinburgh, Scotland on September 27th, 1987 David Vamplew didn’t start playing poker until 2005. He was introduced to the game soon after he started his studies at Edinburgh University. 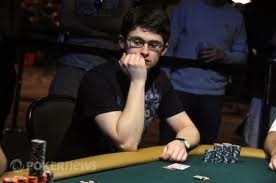 He became keener on poker and in 2009, after graduating with a degree in Mathematics, turned professional. David is the top-earning Scottish poker player of all time with tournament earning just under $2,000,000, and is ranked 15th in the world for his last 12 months’ earnings. I caught up with David on his way to Malta. I believe you grew up in Aberdour. There are a few nice golf courses there – do you play golf? I played golf when I was younger but haven’t in a long time now, I used to have a handicap of about 18 but I doubt I could play to that now. My dad loves golf and is always playing in any spare time he gets. I noticed Stephen Hendry went to your school. I believe he’s a keen poker player, have you ever met him? Nope, never met Stephen Hendry. He’s quite a bit older than me so I didn’t see him around at school or anything but I knew that he went to Inverkeithing High. I didn’t know he played poker, but I think it’s pretty common among sportsmen actually, it is a great game and really fun to play casually with friends as well as on a bigger stage. As you’ve developed your game have you had a mentor, or coach to help? Do you have people you can talk to about your play? I have never had a coach but it has definitely helped me to improve having friends who also play to speak to about hands and get their opinions. I think discussing hands with other people is a great way to improve. What is the state of poker in Scotland? Do you get recognised on the streets of Edinburgh? I think there is plenty of poker going on in Scotland in pubs and local casinos for relatively low stakes which is great for the game but there is definitely not a lot of high stakes action. Do you get recognised on the streets of Edinburgh? Has anyone asked for your autograph? I guess travelling has been a big thing for you this year. I gather you said you enjoyed it. Do you still enjoy it? It is really fun to travel to new places all the time although admittedly sometimes it is just airport, hotel, casino, and maybe a few restaurants. if that is the case it usually means I’m doing well on the poker side of things, though, so I can’t complain. Do you travel on your own or have you an entourage? I usually travel on my own but will regularly split a hotel room with a friend who is also going and I tend to know plenty of people at these tourneys since if you are at a lot of the stops on the circuit it’s pretty easy to get to know some of the other regulars. Are you friends with other players? I believe you are quite close to some Scottish players? Welsh players? There are not really a lot of poker players in Scotland with much success, but Alan Brown, Niall Farrell and Andrew Ferguson are a a few guys I am friends with and could be names to look out for from Scotland. As far as Welsh players, I only know Roberto Romanello. He is a really friendly guy and is doing a great job of representing Wales in poker. What was your impression on Las Vegas when you went there for the first time? Everything is really huge in Vegas and it really hits you when you first walk out on to the strip – I did it a night so got the full effect of flashing lights everywhere and tons of people around you ready to party. it is a fun place, but not necessarily somewhere I’d like to live. The poker magazines have lists of tournament winnings. For new professionals there will be a great deal of expense to account for; hotels, travel, entry fees etc. Has this ever been a problem for you ? In addition to the cost of travelling to tournaments there is also the fact that, in poker, the money in the prize pool all comes from the players so it’s quite possible to travel somewhere to play and make a significant loss on the trip. When I was starting to play live tournaments I would sell off some of the buying to other people for a % of my winnings and would not be going to tournaments that regularly since it can get pretty expensive if you don’t have much success. I would take a shot every now and then with an amount of money I could afford to lose. Any thoughts on getting a ‘proper job’ if you get fed up with poker? Perhaps using your maths degree? That’s not something I’ve really thought much about, I don’t know if I would want to work for someone else after having the freedom of what I am doing now. In the mean time I’m just enjoying things as they are. I am not really a superstitious person and I definitely try not to be superstitious regarding poker, I think that can only have a negative effect on your play. What music are you in to? Do you feel you have a good balance in your life – work / play? The great thing about what I am doing is that my work and play are sort of combined. I believe you have a passion is cooking and restaurants? Do you play ‘balanced’ poker – aggressive at times / conservative at times ? I think it is pretty vital to being successful in poker that you are able to change between styles and I would certainly say I am able to do that. I understand that your birthday is coming up in a few weeks. Are you planning to do anything special? I haven’t got any birthday plans at the moment, apart from that I will be back in Edinburgh at the time and will probably just have a night out there with some friends.